← There’s an Alien in my Apple ! Elizabeth Warren for POTUS in 2016 ! Did you see that video on the news where Elizabeth Warren hoisted members of the bureaucracy that is supposed to regulate the financial sector on their own petards and left them dangling, spinning lies about their incompetence ? No one on could remember ever taking any of the movers and shakers to trial because of their screw-ups, or out and out criminal behavior. So much for regulation of the a$$ holes who caused the recent financial fiasco ! Way to go, Elizabeth ! It is good to hear a strident voice of honesty and righteousness attacking the corrupt bureauroc-rats who are not doing their job. Or, maybe we should simply elect her Tzar for life. Retired 29 May 1987. Now do hobbies: blogging, ham radio, gardening, etc. 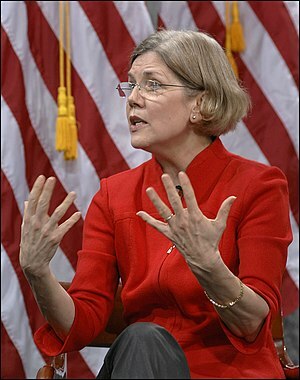 This entry was posted in Miscellaneous Musings and tagged Elizabeth Warren, politics. Bookmark the permalink. I might be an Australian living in Brazil, but this woman is brilliant. I hope she does run in 2016. if not for POTUS, let it be VP.